Brief Synopsis – After her Mathematician father passes away, a women tries to figure out which of his traits she has inherited including possibly his mental illness. My Take on it – I have been meaning to see this for a few months because the oremise sounded interesting and finally got around to it. I was a bit disappointed because I had expected something much better and more interesting throughout. Personslly, I had trouble connecting to the characters and storyline and ultimayely felt that this movie was mediocre and not anything really special. The themes venture heavily into the realm of philosophy and that turned me off a bit. I’m sure there are plenty out there who will enjoy this much more than I did. 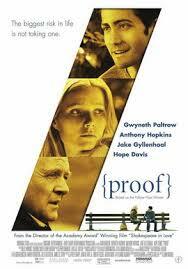 At least stars Gwyneth Paltrow and Anthony Hopkins wrte great as always. Bottom Line – I think that this is a very interesting idea, but I personally didn’t connect with the characters or storyline and felt that this was just an ok movie. Very philosophical in its themes and this is not for everyone because it got to be too esoteric for me. Paltrow and Hopkins are both great as always. I watched this when it came out. Had high hopes but it fell flat. Disappointing. I have always wanted to see this. Don’t know why I keep putting it off. Great take Rob, I can enjoy philosophical movies but they definitely do put a lot of others off if they’re not handled right. That might partially explain why The Tree of Life is so divisive.